Contrary to what you said, the first thing my eyes were drawn to was the landscape because I was curious about it being displayed on a reel. The man provided pathos because he makes me realize that he is another human being like myself. It makes me put myself in his position and feel what he might feel, which is what makes this an effective image. Interestingly, when I first glanced at the image I thought it was a tank. The image of war and unrest is clear no matter how you look at it. The flames, person running and dried out landscape all scream desolation. It is an uncomfortable image to look at yet, that is exactly what makes it successful. I too at first glance though the mechanical structure of the landscape resembled a tank. I perceived the message to show the chaos that war brings the average man. Fields are on fire and things are smoking. I also first saw the person in the picture as a young boy crying and running away from the fires and explosions. 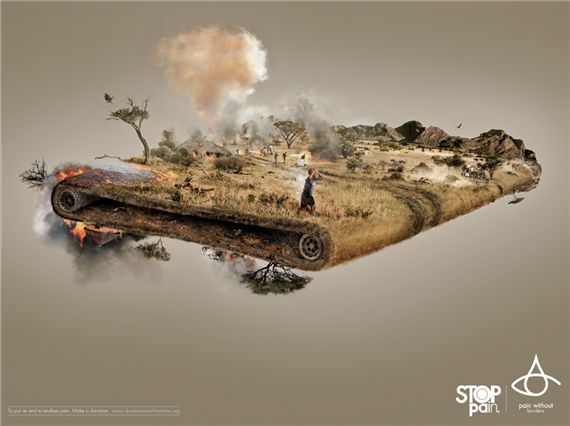 These powerful images are focal points of the picture to evoke pathos and persuade the viewer to support their cause. The conveyor belt in the image really highlights a sense of hopelessness for those involved in Africa. This is just one of many parts of the image that conveys meaning beyond what text could possibly do. The fire, the man in the front, the soldiers in the back; all provide incredible emotional influences far surpassing what a plain text document could do. This is a very interesting picture because it conveys its message very effectively without the use of that many words. Like others, I saw the tank and thought of the oppression of Africa. The boy running, in my mind, symbolizes the hopelessly futile attempt of many to escape this conveyer that pulls everything into chaos and obliteration. The background color, as you noticed, helps to center the focus on the center of the image, as it has a white glow. The dullness of the surrounding color seems to help bring out that hopeless feeling in us; the boy is on an island and the skies all around him are murky and brown, the color of smoke and pollution.